Help : Electronic Fund Transfer Payment Batch. Document No Document sequence number of the document The document number is usually automatically generated by the system and determined by the document type of the document. If the document is not saved, the preliminary number is displayed in "<>". If the document type of your document has no automatic document sequence defined, the field is empty if you create a new document. 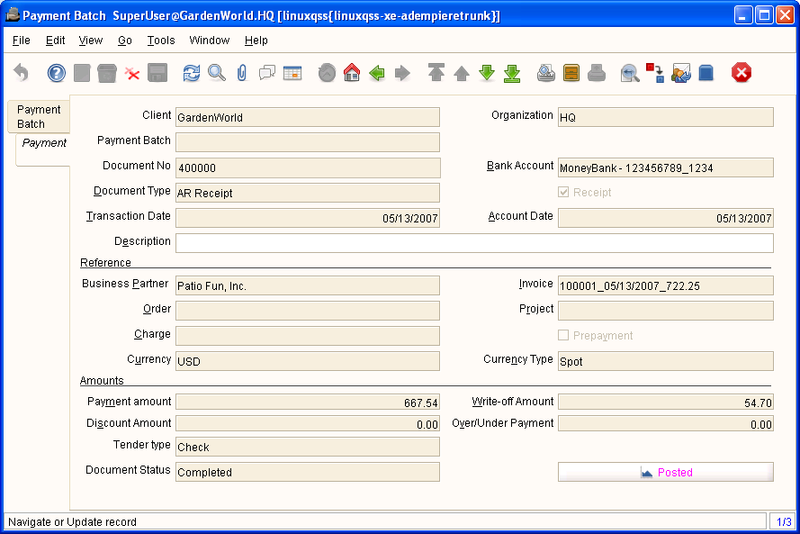 This is for documents which usually have an external number (like vendor invoice). If you leave the field empty, the system will generate a document number for you. The document sequence used for this fallback number is defined in the "Maintain Sequence" window with the name "DocumentNo_<TableName>", where TableName is the actual name of the table (e.g. C_Order). Over/Under Payment Over-Payment (unallocated) or Under-Payment (partial payment) Amount Overpayments (negative) are unallocated amounts and allow you to receive money for more than the particular invoice. Underpayments (positive) is a partial payment for the invoice. You do not write off the unpaid amount. This page was last modified on 14 December 2006, at 14:06.